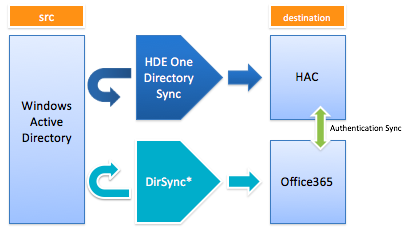 HENNGE One Directory Sync is an account information synchronization tool which is used to relate HENNGE Access Control Service (HAC) and Windows Active Directory.This is One-Way Synchronization. It means that once you create, delete or change any items in the source folder this will reflect in the destination directory. *Note - Please contact Microsoft about DirSync tool. - Items in the red box MUST be the same value. - Office365 ID is used for the login ID of rich clients such as Outlook. HENNGE One is case sensitive. - Username is used for the login ID of web browser. HENNGE One is case sensitive. 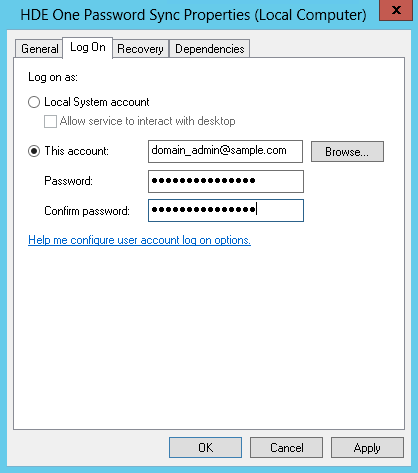 - After finished initial setup of Active Directory, users have to change password before their first login. [Start] > [Administrative Tools] > [Services] check if the status is "Running" and "Automatic". **Note: If Active Directory Web Services was not installed, please refer to the procedures below to add and start the service. 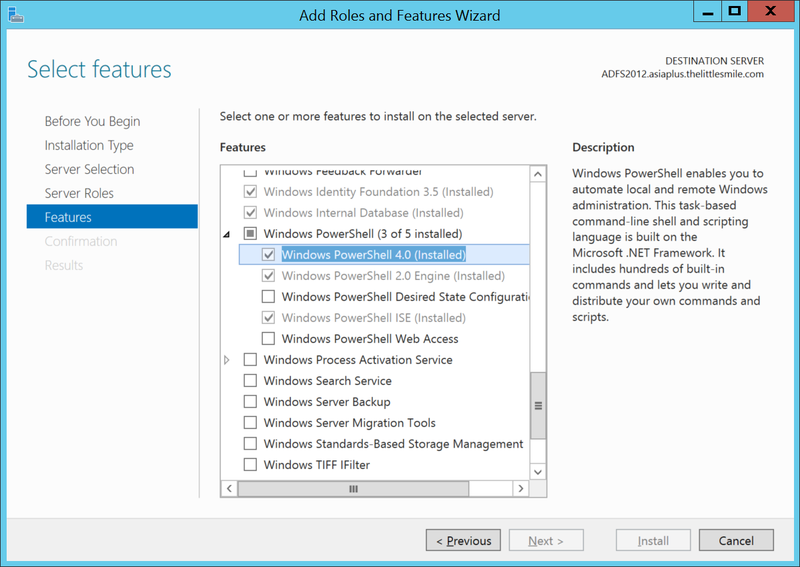 Install Active Directory Managing Gateway Service and Patch. **Note: The server needs to be restarted after the installation. To synchronise password from Active Directory to HENNGE Access Control, you have to create a security group "HENNGE One Password Sync Group" and assign it to the primary group as each users' Unix attribute. Run the .bat file [Assign-HDEOnePasswordSyncGroup.bat] to automatically create a security group. *To run above .bat file regularly by Windows scheduler, please refer to the settings explained in the last part of this article. The script file below will automatically assign security groups to the users. Please start PowerShell to execute these scripts NOT only for the Sync module installation, but also every time the new target user is being added. 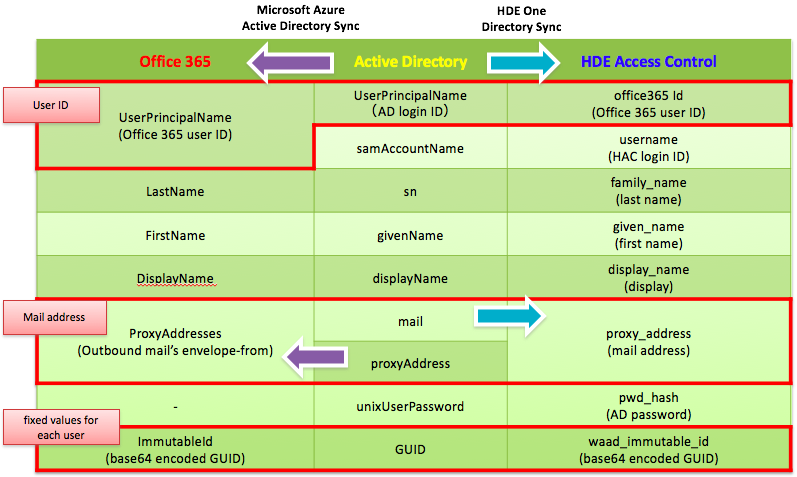 Below Command is an example of how the script works when the target user belongs to SSO targeted domain @sample.co.jp and is active on Active Directory. ps>cd "the folder in which you created a copy of above file"
1. Run PowerShell and execute the command below to record all user information including UnixUserPassword before resetting password. *Note: Please replace "*@sample.com" with the userprincipalname of your test users. 3. Run PowerShell and execute the command below to record users information including UnixUserPassword after the password is reset. *Note: The output files from the commands above will be saved in the directory that the command was written in. Please open the files to confirm if UnixUserPassword has been changed successfully. (i) Output file (Before.txt) : Example of user information before changing password. (ii) Output file (After.txt) : Example of user information after changing password. After installing the HENNGE One Directory Sync, find a file named "Config.ini" in the folder where the Sync module is installed (By default, it should be located in "C:\Program Files\HENNGE One Directory Sync"). To make sure the configuration file is correctly and properly configured before the actual synchronisation, please perform a test run. # cd "C:\Program Files\HENNGE One Directory Sync"
"/n" allows the application to perform a test run. If the command is executed without the "/n", actual synchronisation will be executed. Step 1 - Go to the Control Panel and click into the [Administrative Tools]. In the list of Administrative Tools, click into on [Services] and in the list of Services, look for [HENNGE One Directory Sync]. Right-click on it and click into [Properties]. 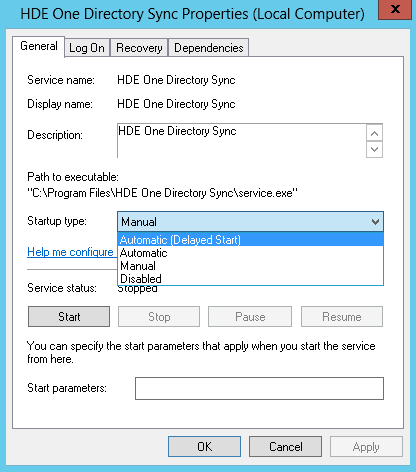 Step 2 - In the Properties, change the [Startup type] from [Manual] to [Automatic [Delayed Start]]. Click [Ok] to save the configuration. Step 3 - On the "Log On" tab, please input the login details of your domain account (Username and Password). Step 4 - Finally ensure that the service is started and running.